Self guided duck hunts for the average waterfowl hunter wanting to duck hunt and not requiring a duck hunting lodge. The cost of anything we seriously are considering to purchase is rarely the reason to buy or not. Anyone can test this idea by asking themselves is there anything they have bought themselves for their own use that was purchased only because it was the cheapest available? For the vast majority of us the answer is quality above cost for anything we truly want. For duck hunting the cost of the hunt itself is small considering the equipment required and the time spent learning the finesse of calling and decoying. That leaves the quality of the duck hunt as a decision criteria. In this discussion the hunt has been further defined as do it yourself with the implied of on wild migratory birds. Migratory birds still leaves us with many options and in our case limited to the Mississippi Flyway within Missouri. Now how to get on those birds and leave it a do it yourself duck hunt means elimination of the many guide services both on public and private wetlands. 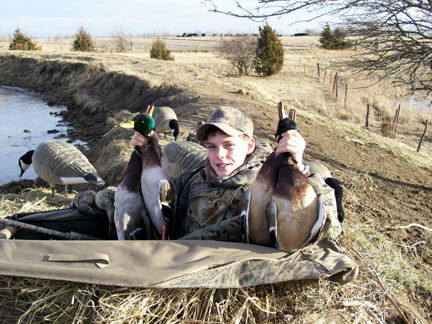 Self guided duck hunts with Mid-America Hunting Association are over private Missouri wetlands from fixed blinds, wade-in, layout boat and field set coffin blinds. Waterfowl hunts begin with teal and end with late goose all for one price and hunting on the hunter's schedule the entire season. Public wetlands while boasting of large acreage are open as aptly described to the public with all the inherent competition and hunter quality issue we need not discuss as they are commonly known. For do it yourself duck hunts the public wetlands option while getting on the right kind of habitat within the flyway does solve the problem of location, but not necessarily the type of hunt the do it yourself hunter is after. That now brings further definition to the quality aspect of the duck hunt. Simply getting on wetlands is not enough. Private wetlands while an often times preferred locality to hunt and frequently superior to public wetlands leave the question open as how to access them unless personally owned or as a guest. The answer is well known – paid access. Paid access can be good or bad depending on several factors. The first of course are ducks. Whenever we pay money for something, we want to get the fullest expected or possible return. This is an automatic disconnect with migratory birds. There are simply no guarantees when the flights will best be worked. This leaves us with how to mitigate the cost through expanding the opportunity for success. One answer which we promote is that the do it yourself duck hunter we prefer to work with is the one that enjoys the hunt first and the bag size later. If a hunter simply measures a duck hunts success based on the number of birds in the bag then he has missed the real value of spending a day on the marsh. That value is the serenity of watching the sunrise, watch the flights, working spreads and calls to better learn the grand art of deception. That alone should be reason enough to call any hunt a success and any ducks that make it in the blind a bonus. For those that understand this value continue to read on. Those that do not should quit this web site entirely. Paid private wetlands duck hunts are either on seasonal paid membership or on a day use fee basis. In the case of the majority of options out there any such paid access is for a single blind or a small number of blinds on one wetlands. This point is important when comparing and contrasting the various options with the goal of mitigating the costs through expanded do it yourself opportunity. When the paid access is for a single location or blind, the hunter has not created any options for him other than that one locality or returning to public wetlands. This does expand the hunter’s do it yourself options beyond public wetlands and does mitigate the cost through the one additional option of where to hunt. However, that is rarely enough to give the flexibility to go where the birds are when we have already agree the decision criteria is based on quality, not cost? That highlighted comment above means more than access to stretches of river duck hunts. Our still water marsh, flooded crop, timber and open water makes for safer duck hunts. Add to that our shooting pools around the blinds being chest wader deep at most adds to that safety factor. It is far more relaxing without big equipment such as duck boats or the constant being on watch for safety on moving water. The social duck hunter comment is exactly as intended. Those that duck hunt for reasons other than for ducks, to enjoy their day, watch their dog or simply seek that satisfaction of having hunted enough need not call us. 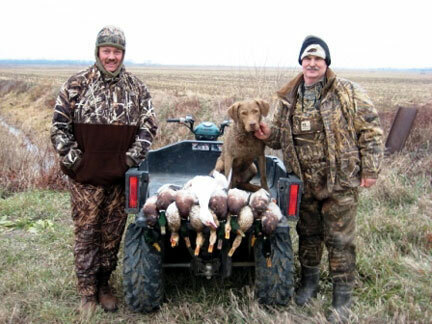 Self guided duck hunts are all that Mid-America Hunting Association provides. However, our self guided hunts have some variety many self guided hunters find adds a bit to the hunt rather than hunting the same location every time out. 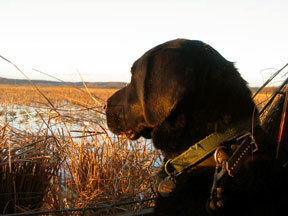 This page offers just one illustration of the self guided duck hunt options available. The first distinction about our self guided duck hunts is they are separated by wetlands with duck blinds and other waterfowl hunting spots such as crop field setups, farm ponds and watershed lakes or places where we have not enhanced the wetlands with levees, pipes, in/out flow water level controls. These do it yourself duck hunting areas are primitive requiring the duck hunter to bring his own blind and retrieving capability of small boat or dog. Denny and Brent. A group that has been with the club for 14 seasons. This hunt was over one of our water level controlled wetlands. A wet and dry set over a watershed lake surrounded by cropland. Never will we advertise limits for all every day. 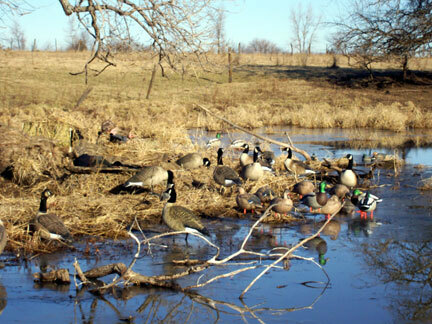 We offer waterfowl hunts over wetlands and from blinds that will satisfy any self guided waterfowl hunter. After that it depends on migration and weather. For those with dogs a slow duck period can be filled with a pheasant hunt.